A folded piece of paper and a seven-inch tail from a yarn butterfly become an answer to a small technical problem. When using a cartoon, like I am for this transparency, it’s imperative to identify the center warp end so I can align the dotted-line center of the cartoon with that one end. Finding the center warp end is my technical problem. 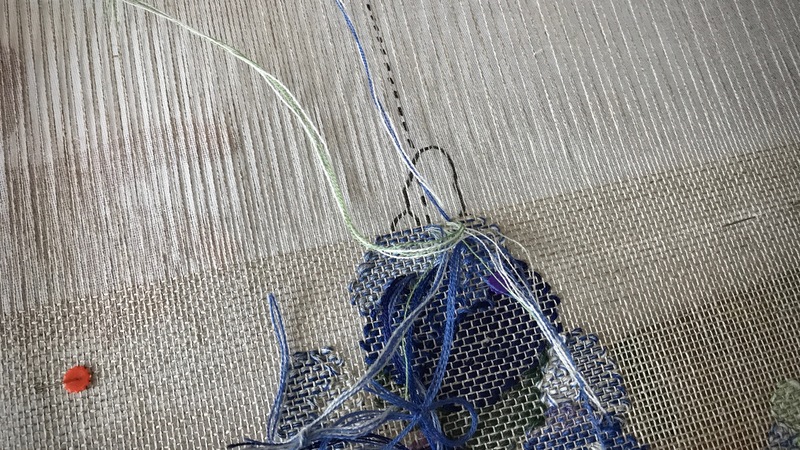 The paper and yarn work together as the tool that helps remove the guesswork. I check the alignment of the cartoon about every inch, and move up the pins that hold the cartoon in place. With these bluebonnets, if the cartoon slides to the right or left by even one warp end it distorts the picture. It’s not enough to eyeball it. I need a way to make sure I am finding, and marking, the exact center end every time. Measure the width of the beater and use a pencil to mark the exact center with a vertical line. 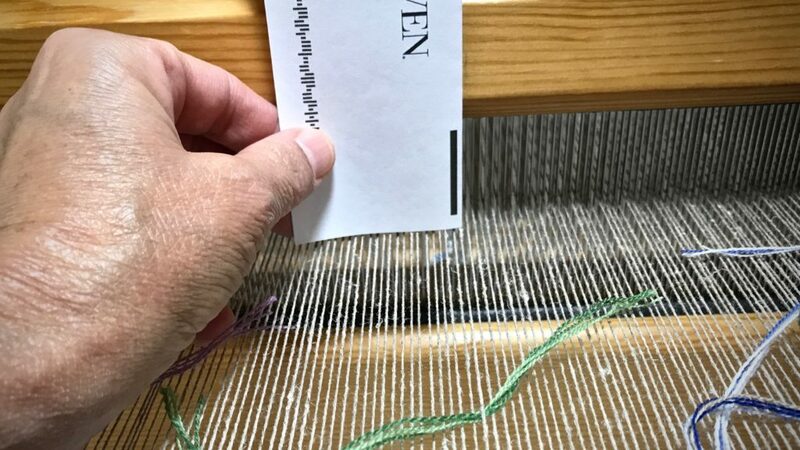 Hold the folded edge of the card against the vertical pencil line on the beater, with the bottom edge of the card almost touching the warp. 3. 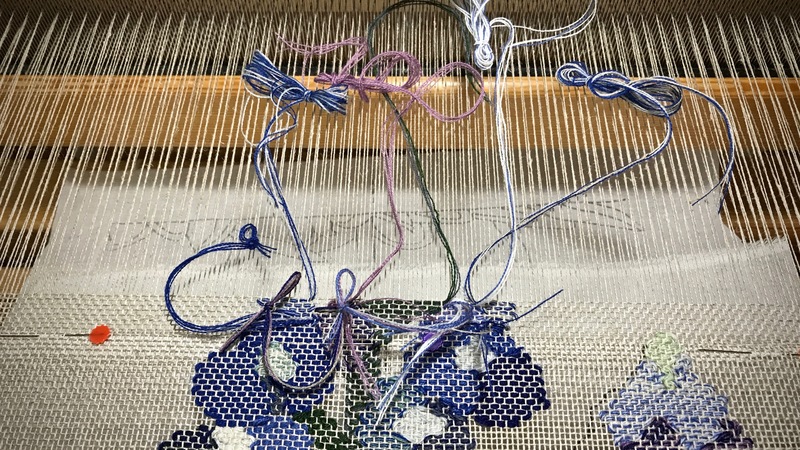 Slip the yarn tail under the center warp end, as identified by the bottom corner of the card. 4. Check the alignment of the center line of the cartoon with the center warp end. 5. 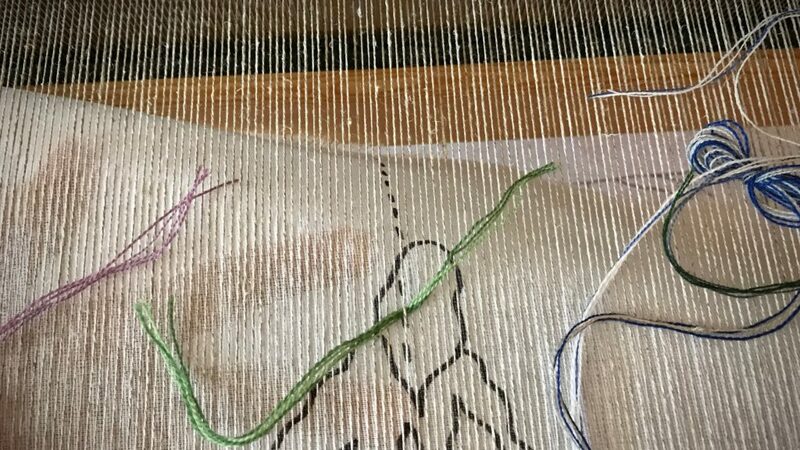 Slide the yarn from the reed to the fell line to check the entire length of the alignment. Reposition the cartoon, if needed. Ready for one last alignment! May you find a solution that eliminates guesswork. Happy birthday, sister. 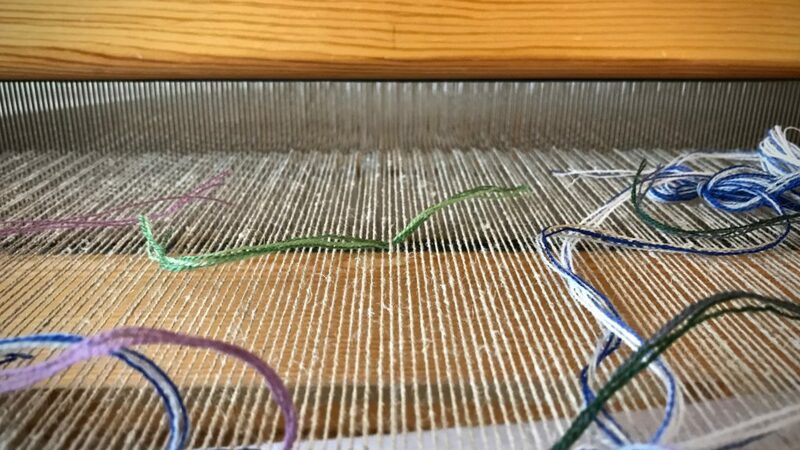 The Master Weaver has created a beautiful picture in you because you consistently align your heart to the center of Truth as a guide. 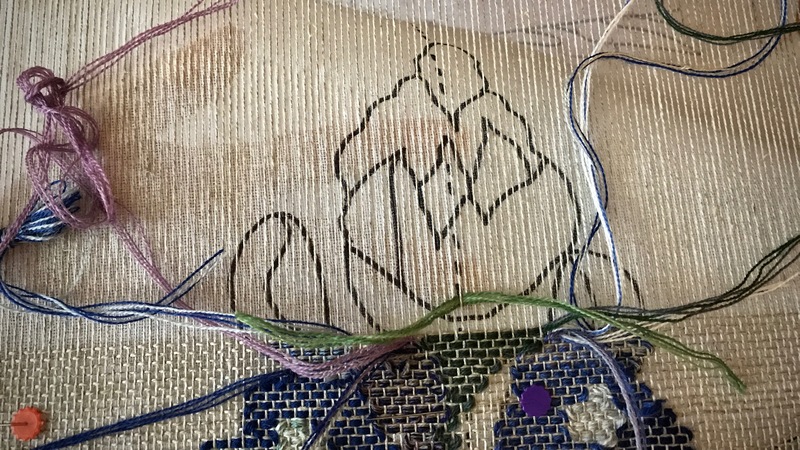 I can hardly wait to see the finished transparency. Thank you, Barbara! What a wonderful thing for you to say. You’ll be one of the first to see the transparency in person. Hi! I can’t wait to see these bluebonnets turned over!! Hi Liberty, It won’t be long!